2nd December is Small Business Saturday, and although that focuses on high street shops, I thought I’d look at small businesses which I’ve interacted with this year, either as a customer, as a freelancer, who I’ve delivered training to, who I’ve met networking, or on social media. Here are the first 5 businesses I’m featuring! As Small Business Saturday falls in December, I think it’s important to feature a Christmassy business at the top of the list. Pretty Gifted sell personalised wrapping paper. 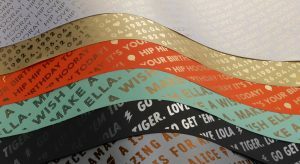 The customer chooses the paper colour, the font, the foil colour, an icon and the size of font, then they have up to 60 characters to personalised the paper. The paper is FSC approved, which means more trees are planted and it’s printed in Cheshire and posted all over Britain. Here’s a video we made in October, how to wrap a gin bottle. For Pretty Gifted, I provide full social media support, blogger outreach and Pretty Gifted blog writing. This year I learned to walk the Nordic way, with poles! After the taster session, I enrolled Dad and I onto the 4 x weekly ‘learn to nordic walk’ course. Although it may sound silly to ‘learn to walk’ (well I’ve been doing it for 35 years so far and haven’t gone wrong too many time except after a few rum and cokes,) it’s surprising that there are actually techniques to learn with the poles which help to project you forward to go faster, open up the upper body to breathe better, and stand taller to help posture! So many benefits, along with the fresh country air and circulatory benefits of the exercise! 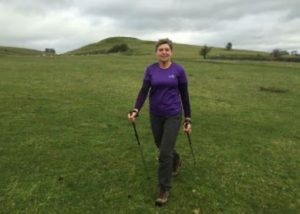 Since completing the course, I’ve been out on a few of Janneke’s ‘long’ circular walks, which are usually around 6 miles of rolling Derbyshire countryside. We set off and get to a good pace, and already I’m thinking about half time, when Janneke opens up her rucksack to reveal homemade healthy granola! Afterwards there are more homemade treats, in Janneke’s garden pod (complete with fire pit) and it’s the perfect healthy way to round up the nordic walking day. Anita James is a Clinical Aromatherapist and another friend I’ve made via the Wire Doves networking group, I’ve become a customer of hers too, like Janneke! I enjoy a reflexology session or back massage with Anita every 3 to 4 weeks! She’s another lady with a pod in her garden, this time there’s a therapy bed, her collection of aromatherapy oils, and beautiful copper distillation equipment that she makes some of her own oils and waters from! Anita teaches aromatherapy all over the World, either face-to-face in her home studio, via Skype, or she’s off flying here and there to teach and mark exams. For those who know me, I’ve had a little project on the go for about a year, building an affiliate website for my energy ball recipes! I make energy balls quite a lot as I’m quite a snacker at my desk, so it seemed a natural step to add all my online marketing knowledge into a site that I can add to in my spare time. I’ve had help along the way from people with specialist knowledge, such as Sarah Liddle from Brickyard Business Support (featured in another blog for Small Business Saturday) who has done the more technical WordPress stuff that I admit I get a bit tangled up in! The website features recipes I’ve designed, recipes I replicate from famous chefs, recipes sent in from anyone (you??) and also a giveaways page where I run prize draws or competitions. Gillian and Annabelle, at Boutitch in Uttoxeter and Sudbury have really supported me with my fundraising for Kenya this year, holding stalls, selling tickets, donating prizes and sending pants, so I wanted to thank them for their support by adding them to my SBS list! They are a true ‘bricks and clicks’ business, with a physical high street presence in 2 locations and an online store which delivers. They focus on ethical clothing in particular, such as organic cotton, fairtrade products and retailers who don’t use child labour to make the clothes. There are always great gift ideas too and locally made gift cards to complete a gift set. If you run a business and would like some support with your marketing, please contact me.